It was a long night. Short catnaps and restlessness divided the hours. I woke up curled in a fetal position low in my sleeping bag, with my sock hat pulled tight over my eyes. I saw light through the knitted fibers and lifted it above one eye to search for my flashlight, which I assumed I accidentally switched on. I was damn near exultant to realize the light wasn't coming from the flashlight. To give you an idea of how happy I was, I just used the word exultant for the first time in my life. I folded the hat onto my forehead and sat up to see that the sun had finally risen. It suddenly seemed so amazing that an object separated from me by 90 million miles of black void could feel as close or as reassuring. The cold wind still hadn’t let up, but it left the air crisp and clean. My hands soon returned to their cold pale purple as I worked through the knotted ropes and repacked. I didn’t get mugged by a bear last night and I was thrilled to get back on the trail and my blood moving again. I continued to gain in elevation. 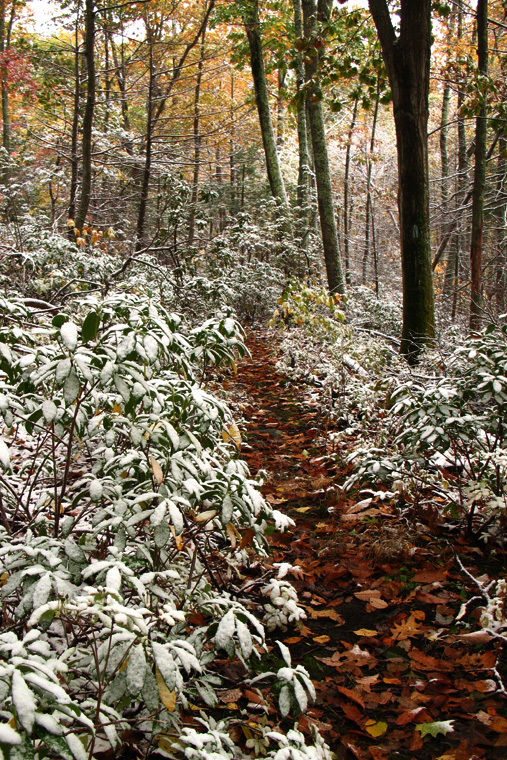 Hefty snowflake confetti fluttered to the ground and soon the forest was dusted in white. Tree branches sagged under the snow’s weight blocking portions of the trail. I smacked the base of them with my hiking poles to knock the snow off. Minus the weight, the branches rose up above my head, as if honoring me with an avenue of crossed swords. By noon, my thermometer confirmed it was above freezing. The snow turned to a combination of rain and sleet. Droplets of water and ice pummeled my raincoat. Snap, crackle, pop. 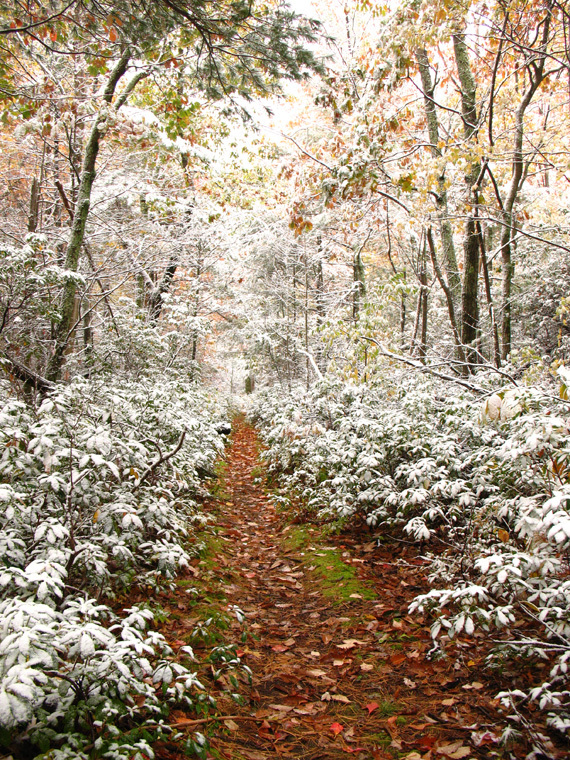 My knitted gloves, gripped around hiking poles, were glittered with specks of moisture. Beads of water glistened on the edge of the raincoat hood framing my view. The occasional hard step knocked them loose, sending them sparkling to the ground. 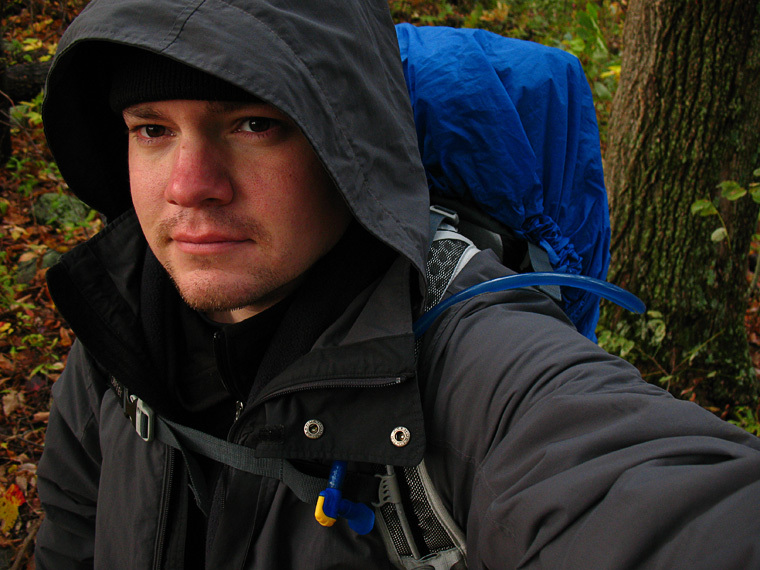 The rain rarely accompanies me on my backpacking trips, but it didn't bother me. Actually, I reveled in it. Not only did it keep others indoors, leaving the trail all to myself, but also the engulfing pattering sound narrowed my focus. I felt even more isolated from the rest of the world. A major reason I escape to the wilderness in the first place. That afternoon, the once snow-white forest floor was already back to soaked brown leaves mixed with red, orange, and yellow. Up ahead the path curved over a creek. I lifted my sock hat on top of my ears, so I could hear the rippling sounds as I carefully stepped across on deliberately placed rocks. The bright autumn foliage is Shenandoah National Park’s most anticipated show of the year, which is what initially lured me to this park. I looked over reports and photographs from the last few years to figure out when the colors would be at their peak. I chose the 3rd week in October, and it worked out perfectly. My route’s frequent changes in elevation took me to ridge tops of rich red-brown oaks, down through canary yellow forests of birch and poplar. 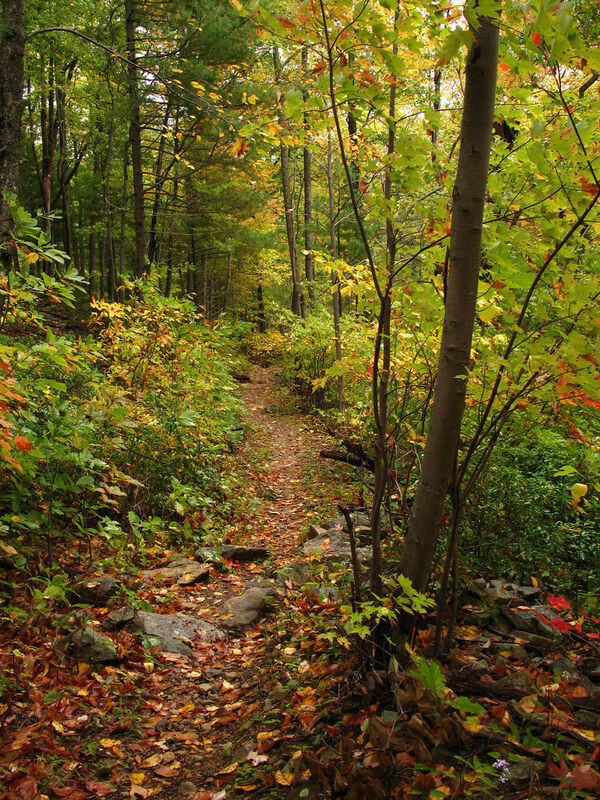 In the valley most trees were still thick with green, but bright patches of yellow leaves were scattered throughout. Some of them now flowing down streams and over waterfalls. 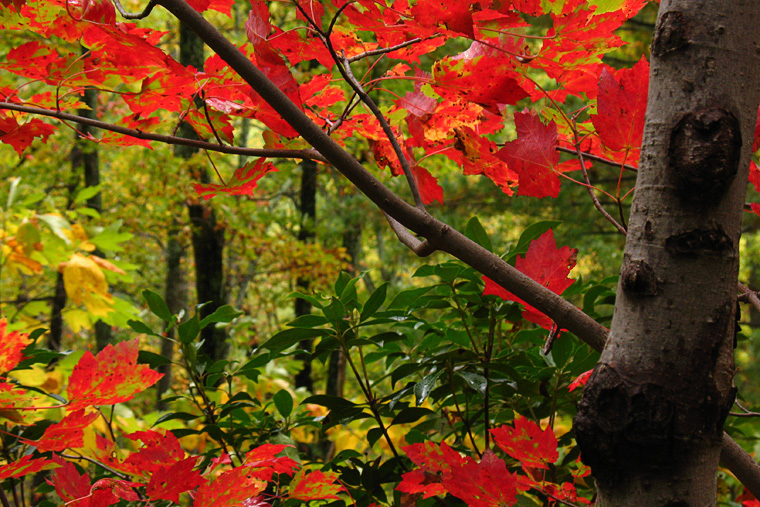 The maples, Virginia Creepers, sumacs, and other vivid red plants were the stars of the show. Their bright pink and scarlet leaves seemed to glow under theater spotlights and grab your attention. I stopped and took off my pack shortly after entering Nicholson Hollow. 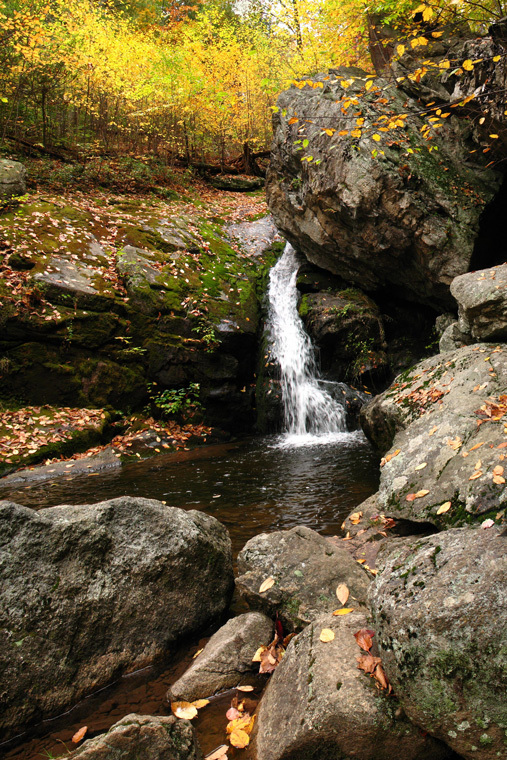 Between the trail and the banks of a gushing stream called Rocky Run, I sat on a tree stump and had lunch. Last night's irritation was long gone. My gaze moved to a clear patch of land which shown through the trees. After eating, I surveyed the area then decided to stay here for the next two nights. It was a rough beginning, but I was so overjoyed to be out here now. I still had three hours of sunlight left, so I could take my time and leisurely setup camp. 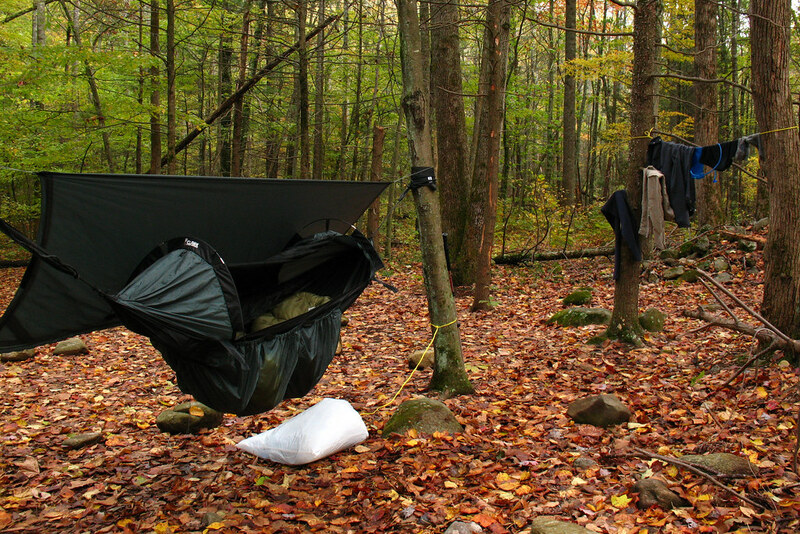 I located two trees to hang my hammock, away from weak branches, next to a large pile of boulders to help block the cold wind. My odor-proof bag filled with all food and scented items, hung high above the ground and several yards away, not attracting all the animals in the area. I spent the rest of the daylight strolling along Rocky Run without weight on my back, and filtered it's water to replenished the supply in my pack. 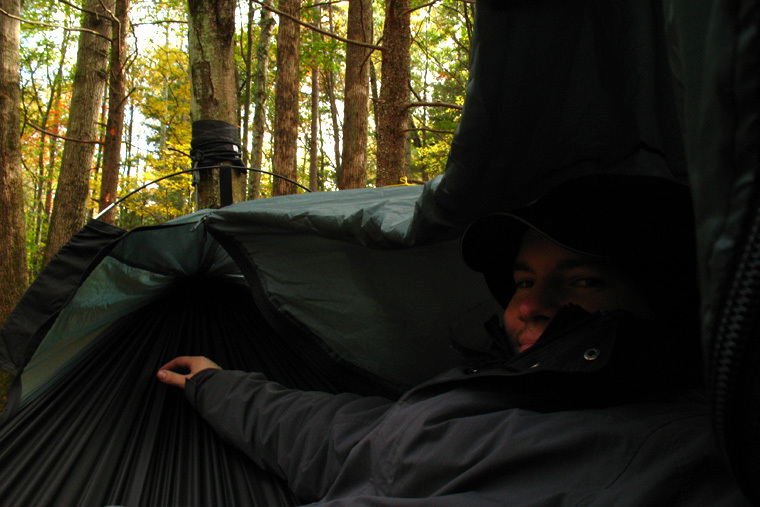 The last dwindling hour of sunlight was spent sitting sideways in a relaxing swaying hammock. Mental note: This is the way the end of a day backpacking should be.